Subscribing to a predominantly plant-based diet can be a daunting prospect. Like any other discipline, it requires determination and motivation. Instead of forcing yourself to get used to eating less of the tasty meat you’ve grown to love, the best way to teach your brain and body to get used to taking in more vegetables is to understand that there are ways to make the experience more meaningful and enjoyable. Through this new series of articles, we hope to introduce our readers to the benefits of selected plants and vegetables that they can use to begin their journey towards becoming healthier. 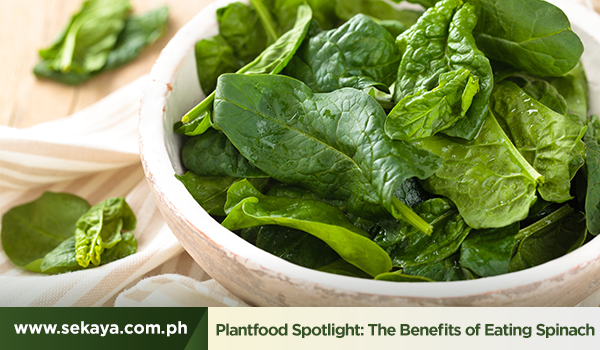 Spinacia oleracea L., more commonly known as spinach, is a leafy green vegetable that is native to Southwestern Asia. Since ancient times, the plant has been known to occupy an important place in the traditional cuisine of a number of Asian and European countries, including India, Greece, Italy, and France. The popularity of spinach is mostly attributed to its many health benefits, as well as its affordability, and versatility. From being one of the main ingredients for hundreds of salad recipes from different cultures to being an ideal topping for certain types of pizza, spinach is widely recognized for its ability to make a variety of dishes taste more interesting. Following the organic lifestyle boom of recent decades, spinach has also been known to be used in a number of juice cocktails that claim to help with detoxification. But spinach isn’t just a convenient ingredient to have around the house to help enhance the flavor of a number of dishes (and juices), more than a tastier alternative to other greens, it is, most importantly, a nutrient-rich food that can help protect your body from a number of conditions. Over the past few decades, studies have proven that spinach contains more than a dozen bioflavonoids that all work to rid the body of harmful free radicals. In 2014, a study1 concluded that the antioxidant and anti-inflammatory properties of spinach can be highly effective in reducing oxidative stress and harmful cholesterol. Another study on the functional properties of spinach from 20162 also revealed the plant’s potential in the prevention of cancer, heart disease, and other serious illnesses, as well as its capacity to aid metabolism. All these benefits attributed to spinach confirm what doctors who practice preventive medicine have been trying to tell us for years; that bit about how eating more spinach and other green vegetables does wonders to improve the body’s defenses against major health issues like cardiovascular diseases, diabetes, and even obesity3. Now, doesn’t all this make you think of spinach and other vegetables in a whole new light? Subscribing to a predominantly plant-based diet, keeping up an active lifestyle, and incorporating any among the infusions of Sekaya Botanic Infusion into your habits, may very well be the beginning of a healthier and longer life for you. For more information about Sekaya and its line of organic botanic infusions designed to promote overall wellness, visit: https://www.sekaya.com.ph/products.